Certain dog breeds tend to bark a lot — usually with good reason though. Other breeds of dogs have a reputation of barking less. In some circumstances (such as living in a small apartment or condo where the walls are thin and neighbors surround you on all sides), it may be beneficial to seek out a dog that might be likely to bark less. Those are just a few dog breeds that usually appear at the top of each list. However, no 2 lists of barking dog breeds are ever alike! For example, Beagles are sometimes placed at the top of the list of dogs that bark a lot. However, it’s just as common is to see Beagles topping the list of dogs that don’t bark much at all! These 2 videos of Beagles show Beagles barking (or rather howling, which is more common among Beagles) …or not. Both behaviors are commonly seen among Beagles. There are many different lists of barking dog breeds, and deciding which dogs to place on which list can be rather subjective. But this is one of the best lists of dog breeds that don’t bark (from the worst offenders all the way down to the quietest dog breeds), as reported in the book The Perfect Puppy: How To Choose Your Dog By Its Behavior and shared by Dr. Craig Mixon. It’s important that you don’t make barking the #1 criteria that influences whether or not you get a particular dog — because all dogs make noise. While some may not bark as much as others on a regular basis, they may make other loud noises instead. For example, Shiba Inu dogs have a different sounding bark, but they don’t make this sound very often. Three dogs that don’t bark much, but make other strange sounds quite frequently instead are Beagles, Basset Hounds and Basenji dogs. Basenjis tend to “yodel” or howl loudly while Basset Hounds and Beagles tend to “bay” — which is a long drawn out very deep sounding noise. Also, don’t overlook the fact that each individual dog (regardless of the breed) has his very own unique personality and style, and barking may or may not be his preferred method of communication — just because. Not to mention the fact that dog breeders and owners can condition their dogs to bark more than others in the same dog breed typically do. This could be a natural outcome of things like crowded breeding conditions, lack of socialization, or the owner’s own personality. 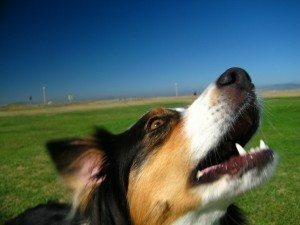 These things — and more — can influence a dog’s general personality and tendency to bark. How the dog acts around children and other dogs. It’s a combination of all of those factors which ultimately determines whether a particular dog will be a good fit for you or not. Remember, in addition to tail wagging, barking is simply how dogs communicate!